This entry was posted in crafty, Dare to Simplify, domesticality. Bookmark the permalink. I used to try to knit ties…as in neckties…around jr high age. I haven’t knitted since then, but sometimes I wish I remembered how. Maybe someday. Nice work! I’m jonesin’ to knit a poncho for my girl right now. Awww to the ye-ah. That would be sweet. man. i wish i could knit. i’ve tried a few times but end up really frustrated and give up. OH I like the colors! that makes me want to do something crafty! If I had to guess, I’d say you already have several projects on the go. Those look terrific!! By those I mean the mittens and the girl. She’s so cute with those smiling cheeks! You have officially been promoted to My Hero. All you need to do is make pies and you will be Molly Mormon incarnate. Just call me Molly-Kate, the happy homemaker. My college-age self would be rolling over in her grave to know I’d given in to all this domestic girly junk but I really do love it. The colors in the mittens are so beautiful. I wonder if I have any hidden knitting skills? You make it look so easy. Darling, you are the queen of awesomeness and crafty talent. I just started knitting socks, something I’ve always avoided because they seem like they would take forever, what with the freaking tiny needles and skinny yarn. It turns out I was totally right. I actually think of you when I knit. I knit every night. My stash is exploding out of the huge basket that I have to hold it in! It is very relaxing to me. I used to think arthritis would be a problem too, but actually it’s the opposite! The constant use of your hands keeps your joints fluid, since your hands should be loose not tight! Keep it up! I thought I’d never get beyond scarves, but just finished my 6th pair of socks, and a sweet dinosaur hat for my son! 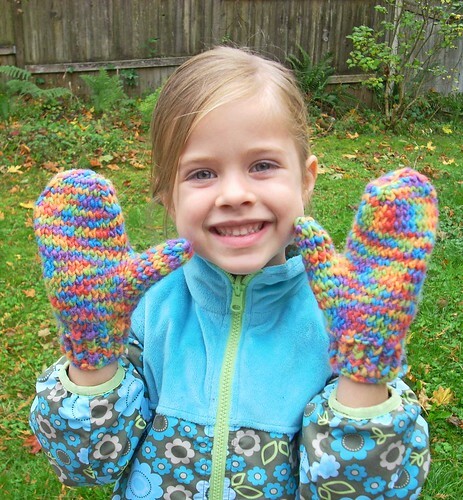 Gorgeous colorway and the finished mittens look adorable–‘course it could just be because the model is so darned cute! Knitting is totally therapeutic for me. And it’s cheaper than *real* therapy. Those are soo cute!!! You did a great job. If you want access to a database with a ton of free patterns you should join Racelry. Knitting is so addictive and you get to have fun wearable tings when you are done. I was going to suggest Ravelry too. There is SO much there it can be a little overwhelming but it is such a fantastic source of knitting wisdom (and free patterns!) I’ve been knitting hats like a crazy woman this year. I need to buckle down and do some real sweaters! I love the mittens. I haven’t tryed knitting any of those yet! (Oh, and socks… I’ve tried… I have big feet.. those needles are very small… maybe someday…) If you need any help in town feel free to shoot me an email. Laylee has the best taste in colors. Fabulous mittens! 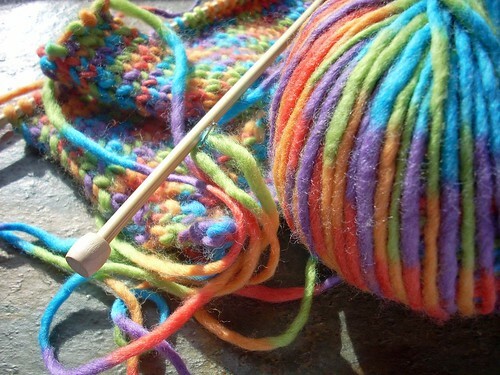 I so want to re-learn how to knit. I learned about 6 years ago and when I picked up the scarf that I half-finished last year, I couldn’t remember a blasted thing. To bad I didn’t learn as a kid. Maybe we’ll have to have a knitting party. No kidding, cutest 5 year old in the world! That kid is just fantastical in every way. I just love her…and she’s getting more and more fun to talk to on the phone. Can’t wait to be there in person and squinch her and Magoo all over the place! And the mittens are great – definitely worth the effort! Good job K! I just got into knitting myself a couple of years ago, so I can echo your sentiments! It’s fun and makes me feel so crafty. My problem now, like most knitters, is restraining myself from buying yarn until I have to eat it. 🙂 As said above, Ravelry.com is helpful and fun, and I really like some of the patterns at knitty.com because they’re cute and modern instead of old and frumpy. Way to develop your talents–I’m sure your grandmothers are proud! Those mittens are darling! My grandma taught me how to knit when I was little, but I haven’t in years. She made my girls some mittens two years ago. Handmade mittens are so special! Love the Mittens!!! Just wondering if there’s any special reason your blog was not included on “blogs we love” on the parenting site? I love finding someone else who knits! It’s addicting and relaxing all rolled together. I’m really digging crochet right now. I could never knit loosely enough to not get aching fingers–but I could crochet FOREVER. You want something really addictive? Do a Google Image search for “amigurumi”. I started knitting a shrug to keep me warm while nursing my son. Hmm. The last time I worked on that project was when he had his first heart surgery in 4/06. I know I packed it up with me when we moved because knitting and quilting were the only hobbies I allowed myself to pack. His little sister is almost weaned so I hadn’t bothered to unpack it, but it’s cold here today and I may just want some extra sleeves even if I’m not nursing. I’m gonna at least get that thing unpacked today! Very cool. I have that same yarn, but all I ever make is hats. 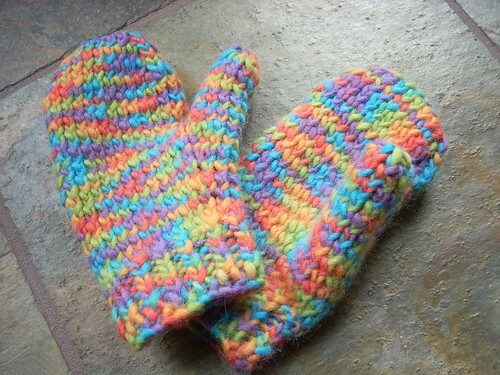 I’d love to make mittens. Well, I just finished a speed racer coat entirely designed by me and lined so that he can wear it as an actual coat after Halloween…what brownie badge to I win? I can’t say I was blissed out during the process though. Fabulous mittens! You’re so talented! Knitting has always intimidated me for some reason…..
Hey, I remember those brownie days…. and the girl guides. Good times with the owls! Your mom always had great camp songs! I must have not earned that knitting badge though, cause I don’t recall learning how. I do remember my mom teaching me to crochet though. Great mitts! I should get me a pattern and learn to knit, cause I love mittens. 🙂 Perhaps I’ll become a brownie leader one day. I just started in the summer, but I’ve postponed it already.